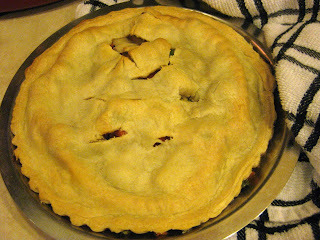 * A pie pan if you are making a one-crust pie. If two-crust, use the pan that comes with the frozen crust. * Frozen vegetable mix - choose what you like that would work in a pot pie. 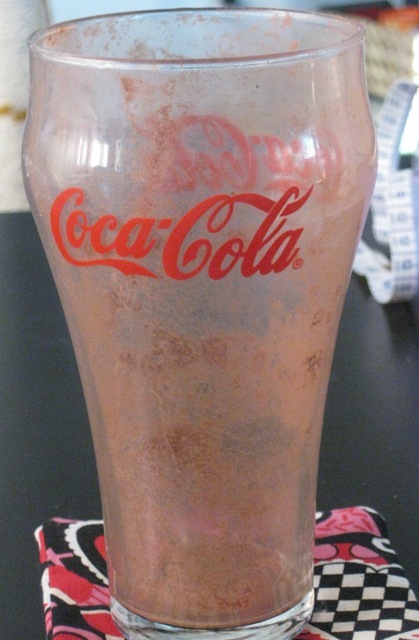 About 32 oz. should work. 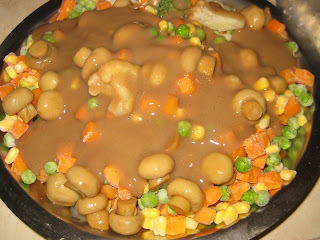 * About 1 c. mushroom or other veggie gravy. Can be from a carton, mix, or your own invention. Preheat oven to 350 degrees F. If you are going for a two-crust pie, place the vegetables (and mushrooms if using) into the bottom crust. Mix gently if necessary. 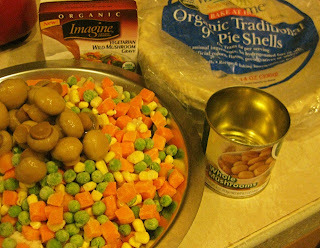 If you want a one-crust pie, dump the veggies and mushrooms into an empty pie pan. 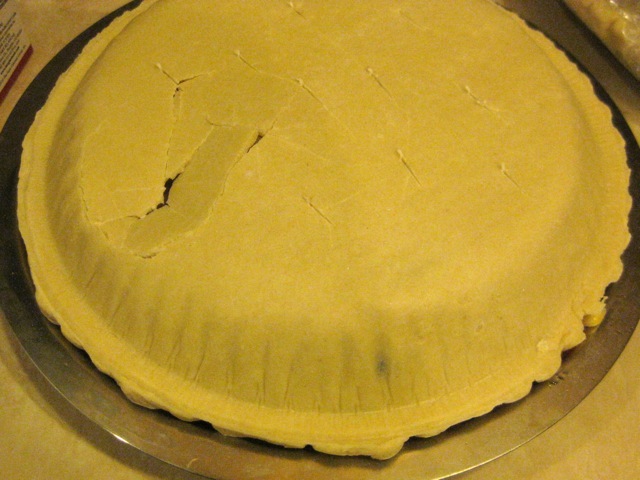 Cut some slices into the crust to vent steam. 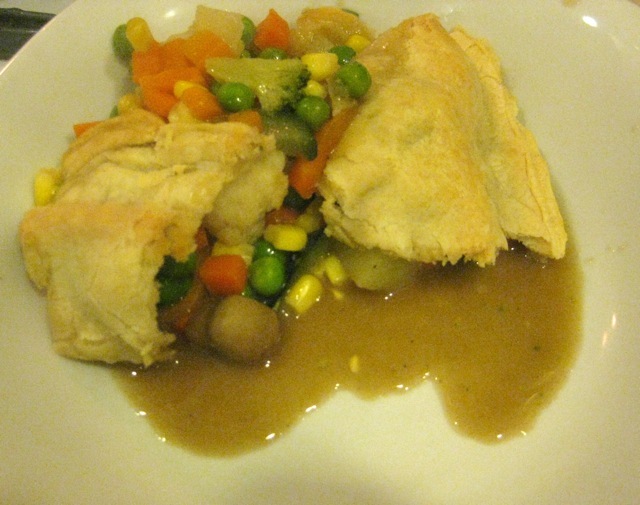 Variation: Cook the vegetables and gravy together in a saucepan until warm prior to adding to the pie pan. In this case raise the oven heat to 425 and cook for about 30 minutes, or until crust is browned and filling is hot. I haven't tested this option myself so I don't know exactly how long it should cook! This is not the picture I meant to have in this post. I meant to have a full glass of my version of a mocha coffee freeze (aka "frap"). But I couldn't let it sit. I had to drink it right then. So will you. Option: use instant coffee, 1 T. or to taste, and a little more soy milk, instead of the 1/2 c. strong coffee. One obvious advantage to making your own is the quality of the drink. Use high-quality cocoa and coffee and you'll notice. 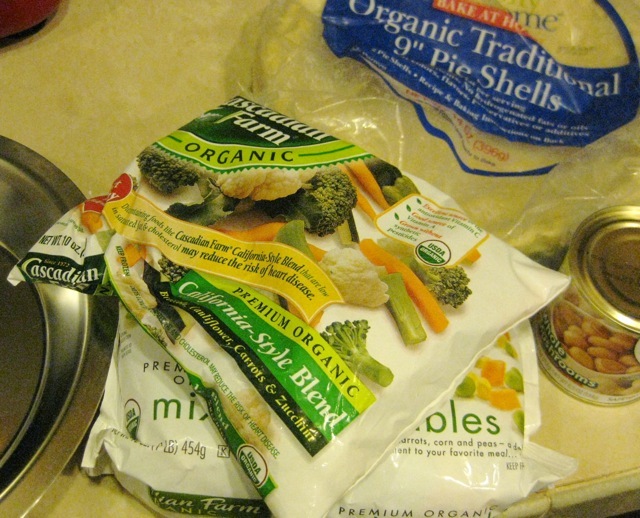 A young couple from the small coastal community of Los Osos, California is taking its vegan awareness to the stores. Jeffrey Bailey and Veronica Rains offer cooking classes in their home, cater special events, and take part in other local events. Recently they have started to create and sell baking mixes at farmers' markets, in some local groceries, and online. * They are made with high-quality ingredients, including as many local ingredients as possible and healthier sweetening options. Most of the ingredients are organic, none are artificial, and there are no preservatives. * The packaging is simple and recyclable, a sealed paper bag that reduces waste. * The baked goods taste good! Choices include chocolate, vanilla, lavendar, lemon poppy seed, and chai spice cake mixes, and corn bread mix. Gluten-free mixes will follow soon. Rains and Bailey behind their work. Bailey and Rains have been vegetarian for over 16 years. Rains has a culinary degree and teaches vegetarian, vegan, and raw food preparation. The Wholesome Chow website includes more than baking mixes. There are recipes (vegetarian, not all vegan), event details, sample menus, and more. Preheat the oven to 450 degrees F. Peel as many potatoes as you feel like eating, but no more than can be spread on a cookie sheet in a single layer. Rinse and slice into french fry shapes or round slices, whatever you like. Spray a cookie sheet with spray oil mix, or line with parchment. 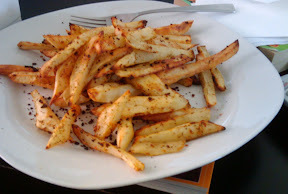 Pile the sliced potatoes in the middle and sprinkle generously with a seasoning mixture of your choice. Mix it up with your hands and spread the slices in a single layer. Place in oven and cook for 20-30 minutes, depending on how thick the slices are. Turn the slices after about 10 minutes and again after 20, or as needed. You'll know they are done when the edges are browned and the slices have puffed up a bit. Remove from oven and place in bowl or plate. Salt to taste and eat right away! 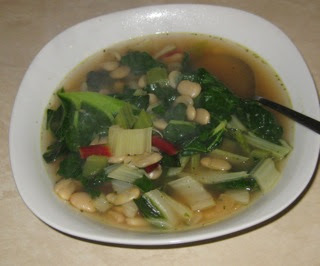 I was scanning my email the other day and saw a post from allrecipes.com that featured a white bean and spinach soup. I scanned the recipe for a sense of the soup and went to my kitchen. * Took my soup saucepan (I guess it would be called "medium" in size) and added water to it, maybe three cups. * Threw in two vegetable broth cubes (the 2-cup variety). * Added a teaspoon of minced garlic from a jar in the fridge. * Rinsed a small bunch of swiss chard, cut off bad parts, sliced the stems off (I usually make an upside down V in the stem to get most of the stem away from the leaves but big deal if you don't). As I cut the stems into small pieces (1/2" each, about) I tossed them into the pot. * Cut up the chard leaves roughly. * When the stem pieces had cooked a few minutes (five - eight +/-) and were about done, I tossed in the leaves. * Rinsed a can of butter beans and tossed into the pot. * Heated through, making sure the chard leaves were cooked enough to my taste (very short time). I ate it that way, adding a bit of salt and pepper at the table. Some cayenne would be good, too. An added benefit, to me, was the nice flavoring the butter beans added to the broth that would not have come from cannelini beans. Yum!! I ate it all, I am a little embarrassed to admit. L.A. Area Residents: Veg Out! I have tested a few vegan food delivery services (See posts on Veggie Brothers and BuyKind ). Because I live in an area of small population, I have had to order from other states. Orders arrive in cartons with special cold-packs and the shipping is fairly pricey. The food was good but sometimes the packaging left something to be desired. For those in the greater Los Angeles area, and even beyond to San Diego and Santa Barbara, there is another option: Vegin' Out. Vegin' Out is a fresh vegan food delivery service. Orders placed by Friday are delivered fresh on Mondays. Beyond the greater L. A. area they are fed-exed and arrive Tuesdays. The basic order will provide nine meals (three of each of three entrees, plus sides and desserts). A double-order saves money. All food is vegan. The price for a single order is $110, $125 if FedEx is necessary. Cheaper than restaurant delivery but more than home-cooked, of course. Because of where I live I can't test this out. If I should find myself in Los Angeles for several days and it's convenient, I might get the chance. As you might imagine, the testimonials include some from well-known stars, like Alicia Silverstone. I would like to hear your experience if you try this or have tried it. Please let us know your experience. Combine 1/2 c of the rice milk with the cashew butter and tofu in a food processor. Process until smoothly pureed. To serve warm, transfer the puree to a small soup pot. Add the rest of the rice milk and the remaining ingredients, stir together, and heat until just warmed through. Adjust the consistency with a little more rice milk if needed. Check the seasoning and serve. 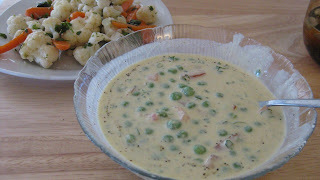 I served the soup with a side of cauliflower and carrot salad, also from the same cookbook. This cookbook has become one of my favorites. Good food, interesting and fun, and easy and fast to make.